New owners - Available for holiday let this summer. 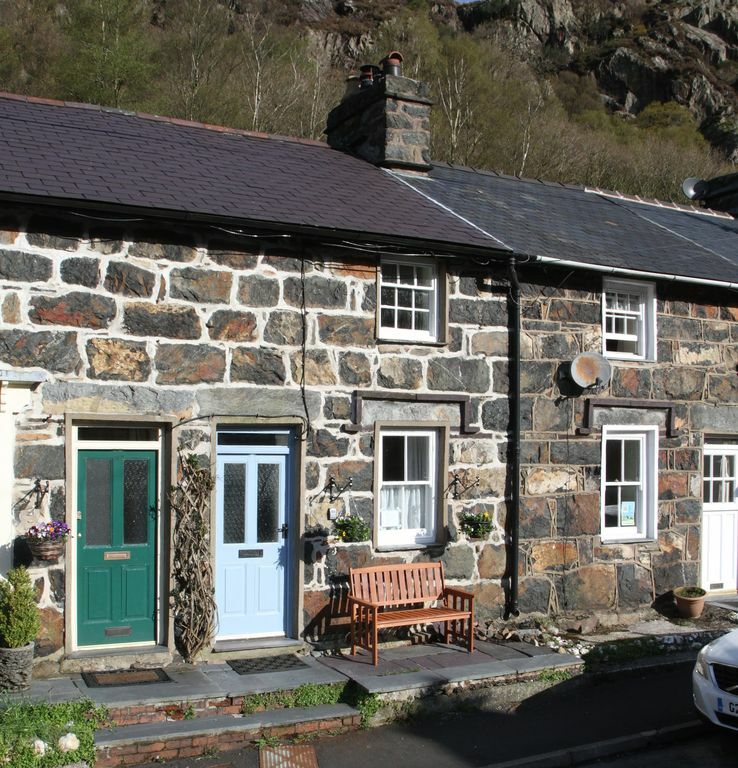 Charming Grade 2 listed terraced cottage which dates from the 1850`s, located in Gwynant Street, and just a few minutes walk from the centre of Beddgelert. This tastefully decorated cottage has an open plan living room, kitchen/dining area that is heated via a log burner and wall mounted heater: electricity is free. The kitchen/dining area is well equipped with an electric cooker, fridge, microwave and a dining table that seats four. There is also a small freezer in the utility area. In the lounge area, there are two large 2 seater sofas, a TV with free sat, a DVD player with selection of DVD`s, Music CD`s and books. Also, downstairs is the bathroom which has a toilet, handbasin, shower and shaver point. The two bedrooms are accessed via stairs from the lounge. There is a two way switch for lighting on the landing for both ascending and descending the stairs. Care must be taken when using the staircase. The master bedroom has a double bed and the second bedroom has 2 single beds. Both bedrooms have wall mounted heaters. Bed linen is provided but please bring your own towels. Please note we operate a non smoking policy within the cottage. Well behaved dogs are more than welcome, but please ensure that they are kept downstairs and off the furniture. Outside there is an elevated terrace accessed via steps with mountain views and garden furniture. Roadside parking. The village is set in the most stunning scenery, nestling within the mountains of Snowdonia National Park. The cottage is just a short walk to a good selection of shops, including a National Trust shop, pubs/hotels, restaurants and cafes. There is so much to do and explore in and around the area of Beddgelert. Walks and climbs for varying abilities, there is the Welsh Highland Steam railway which is serviced by a station in the village, a bike hire centre and even a bus service. Apart from the mountains, and of course Snowdon, Beddgelert is well placed for visiting seaside resorts. Porthmadog is but 7 miles away and, just two miles further, Black Rock Sands with its wonderful large expanse of beach. There's beautiful Borth Y Gest with tucked away beaches and lovely bistro, Cricceth with a beach front, Art deco restaurant overlooking the castle and Portmeirion with its Italianesque village. Downstairs bathroom consisting of shower, toilet, hand basin and heated towel rail. Lovely river side walks within 40 metres of the cottage. A set of instructions are given in its use. A variety of DVD including DVDs for children. There are books and maps about Snowdon and also a good selection of fiction books. A selection of various music CDs. The table and 4 chairs are located on a raised terrace with beautiful views. A lovely place to relax with a mid morning coffee or a glass of wine in the evening. We stayed here, 2 girl friends, for a winter walking week. a super base with everything one could want. Clean. Well stocked in its kitchen, warm, comfy and dry in living and bed rooms. Very steep stairs and downstairs bathroom needed care during the night, one of us slipped top to bottom painfully but got away without serious injury thankfully. We were very alarmed to here of your mishap on the stairs and also so very glad to here that no one came to any great harm. In our defence the incline of the stairs is typical of many of the older properties in Beddgelert and is Grade 2 listed. However, we have made particular note and have decided to forewarn future guests to take extra care on the stairs. We do hope that this experience has not impaired your enjoyment of the cottage and that should you wish to return to Beddgelert, for another walking holiday, that you will once again choose our cottage. We were blessed with warm and sunny weather and our stay exceeded expectations. Very cosy, warm, clean and comfortable little cottage, fresh and tastefully decorated throughout. We stayed in Beddgelert for two weeks, stunning scenery, fantastic walks, steam railway, overall a beautiful area. First week reasonable weather with some dry sunny days. But the second week was extremely wet, and windy. This is not a problem for us, we still very much enjoyed walks and going out, but, we found the drying facilities in the cottage woefully inadequate with only a clothes airer. This would have been fine under normal cold weather conditions but it was warm and we didn’t need to light the wood burner, we’d have roasted alive in there!! We had proper storms and really struggled to dry out our clothes and boots. Also some more instructions would have been helpful for when to put out the dustbins, how to operate the microwave, and how to operate the tv and freesat together, not just which control is linked to which media, but how to operate them and in which order.....we had a few puzzled times trying to work it all out! Otherwise, everything was perfect, very comfortable, we had a lovely relaxing holiday, and would recommend a stay! Lovely cosy cottage in a very pretty village. Lovely cosy cottage in a great location. Modern with all the facilities. Very clean and homely and we will definitely be back next year. Had a lovely chilled out holiday. Great base camp for exploring Snowdonia. Wonderful little cottage with great views and well positioned for exploring the area. Stunning views, great walks and beautiful little village.